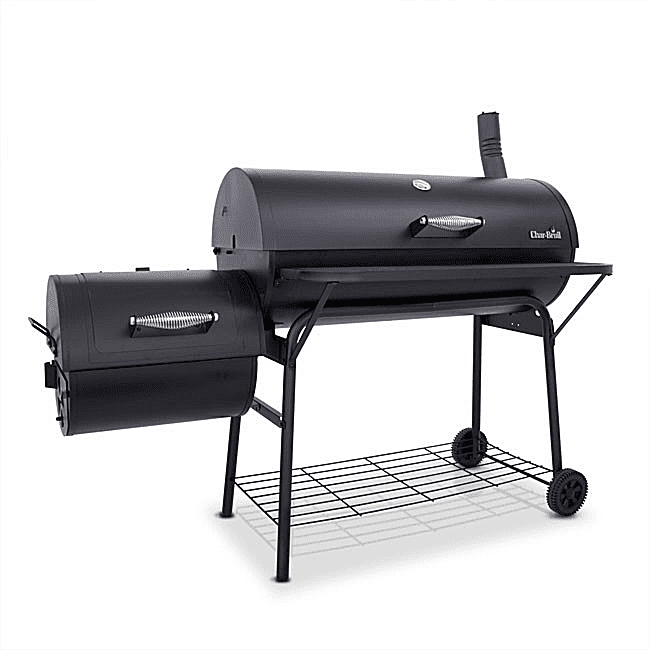 Char-Broil American Gourmet Deluxe Offset Smoker. Char-Broil LLC. A smoker is an apparatus for cooking at low temperatures in a controlled, smoky environment for the smoking of food. It's a piece of cooking equipment for making barbecue. Now, there are a lot of different kinds and types of smokers, from small electric units to large smoker rigs big enough to feed an army, literally. Smokers are powered by a wide variety of fuels, including electricity, propane or natural gas, wood, charcoal, and pellets. Regardless of the fuel, the job of a smoker and the person who tends to it is to maintain a stable smoking temperature somewhere around 225 degrees F/110 degrees C. There must also be smoke. The traditional smokers burn wood to create both heat and smoke and cook your food. Electric smokers need to have wood added to a heated chamber to produce smoke. Technically, any piece of cooking equipment that can hold a low temperature for several hours and create smoke is a smoker.